Annapurna Thorang La Trek is one of the most amazing means of getting close to the rich natural, cultural and spiritual heritages of Nepal. Also referred to as Annapurna Circuit Trek, it is a chief trekking route that not only offers an opportunity to observe the Himalayan grandeur of Nepal but also explore and discover the ethnic diversity and way of life of Himalayan people. You are accompanied by the natural, historical, cultural and spiritual heritages. You can add during the Annapurna Thorang – La Trek is the daunting cycling on the pass itself. It is regarded as the most adventure filled activity to do in Nepal. The added attraction of this trekking is the chance to see the lower Mustang area of Nepal as well. The mystical Muktinath temple and the nunnery with ever flaming natural light provide the amazing journey up in the Himalayas. The pass is located at an altitude of 5416 m from the sea level. Finally the spectacular view of the plateaus, Himalayas, and the upper belt Nepalese geographical terrain. A must-see destination circumnavigating the Annapurna massif. For the best experience, plan your trip for either October-November or April-May. Bharal Adventure is an advocate of the adventure and authentic traveling in Nepal. There Annapurna Thorang – La Trek is the best package for the trekkers to enjoy the delightful nature and culture of the Annapurna region. Therefore Bharal Adventure assures you the best hospitality and quality services. Soon after breakfast, we will head on a long drive to Beshisahar from where a local jeep will be hired to take us to Syange. This drive is a tremendous opportunity in understanding the lifestyle, culture and everyday life of the rural people. From Syange starts our trek to Jagat the night will be spent. The trail up to Chyamje will be followed as soon as the breakfast ends. Crossing the suspension bridge, the trail is followed uphill through the dense oak forest proceeding further until the emergence of a valley. As we cross Kodo, the ascend to the village of Dharapani begins. Fourth day starts with trek to Chame followed by a quick breakfast. The trail ascends along the mule track through fir forest following the river amidst the highest oak and maple trees. The stunning views of major Himalayan peaks shall accompany the journey that comes to an end for the day at Chame. Following a steep and narrow river valley winding all the way through a deep forest, the trek to Pisang will be a wonderful experience filled with the sight of Pisang peak and Annapurna II on the way. There are two route options to choose from to trek to Manang. One is the easier route following the valley floor via Hongde while the other strenuous route follows the river on the north side of the valley. It takes approximately three more hours to trek through the second route in comparison to the first. Both trails offer a magnificent mountain view as the travelers walk through the grazing fields of the yaks. From Manang, the path descends to a Chorten and turns to northwest going down to the river. As the Jharsang Khola is crossed via suspension bridge, pine forest and wheat fields welcome the travelers as they approach Khangsar, a Gurung village. A small monastery, Chortens, Mani walls and prayer flags are nestled in the village where a stop is made for overnight stay. This days' journey is set aside for acclimatization utilized by visiting monastery, going on a side trip to Gangapurna Lake and going on an excursion around the lively villages. Also a visit to Himalayan Rescue Association Clinic will be arranged. The climb to the pass begins early in the morning. 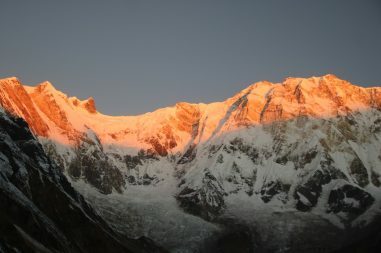 Although the ascend is very steep in the initial stage, the peak becomes sloppier as the climb proceeds through the rocky ridges up to the top of the pass at 5,416m. The 360 degree panorama of the snow capped peaks extending northwards into Tibet is a breathtaking sight along with the peaks of Annapurna range and the unfathomable Kali Gandaki gorge staring right in front of us. From here, the trail descends steeply down to Muktinath which is a reverent pilgrimage sight for both Hindus and Buddhists pilgrims at the same time being a home to many ethnic Tibetans and holy Buddhists. The morning will be spent on visiting the Muktinath temple that holds equal significance both for Hindus and Buddhist followers. The 108 stone taps at the temple is one of its major attractions. After the visit to the temple, we shall trek back to Jomsom where we will be staying overnight. The morning flight takes us to Pokhara where the day is spent walk around the streets of the city or watch the sun set along the horizon above the charismatic Fewa Lake. Than we drive back to Kathmandu along the scenic highway in the company of Trishuli River. The guests shall be taken to the airport approximately three hours before there scheduled flight by one of the representatives of Bharal Adventure. An experienced English/French/Chinese and Geramn-speaking trek leader (trekking guide), what kind of trekking leader as you needs, assistant trek leader (5 trekkers: 1 assistant guide) and Sherpa porters to carry luggage (2 trekkers: 1 porter) including their salary, insurance, equipment, flight, food and lodging.